This is my third Rocket R & D (Cluster 'R') rocket. It comes in a bag with 8 pages of detailed instructions. It comes with a metal cable attachment on one of the two plywood centering rings for the shock cord to connect to, and it uses a 15 foot bungie for the shock cord. The body tube has the fin slots precut, unlike the 2.6" version. It uses 7/32" plywood fins (not quite scale) with through-the-wall mounting into some FIRM (Fins with Internal Root Mount) strips, which are small wood strips that glue to the motor mount with a groove for the root edge of the fins to insert into. So much for the kit. 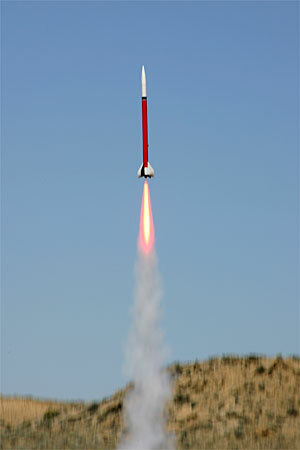 Instead of plywood fins, I am using 0.125" G-10 fins made for me by Public Missiles Ltd. I screwed up the original 54mm motor mount (the fins sagged while curing), so I tore the fins off, sanded down the TTW tabs, and used a LOC 3" motor mount tube with four homemade 3/16" plywood centering rings. I laminated the body tubes with a layer of 1.8 oz. Kevlar® cloth, followed by a layer of 5 oz. and 2 oz. fiberglass cloth. 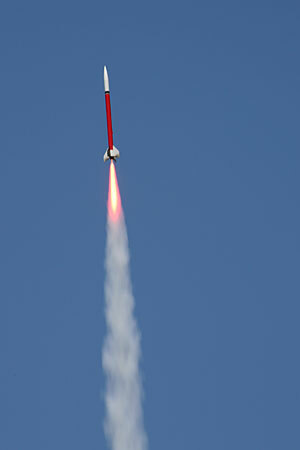 The rocket will utilize dual deployment, with Missile Works RRC2 altimeter in the coupler. I'm using ROCKETMAN R12C and drogue parachutes, and HeatShield parachute protectors and 5/8" Kevlar® shock cord from Pratt Hobbies. Motor retention is assured by an Aero Pack motor retainer. I used conformal launch lugs from ACME Engineering. 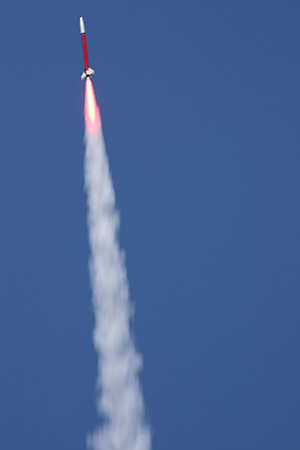 1) 5/08/99 J415-W Excellent flight, but main chute deployed early. Missile Works RRC2 reported 4124 feet. 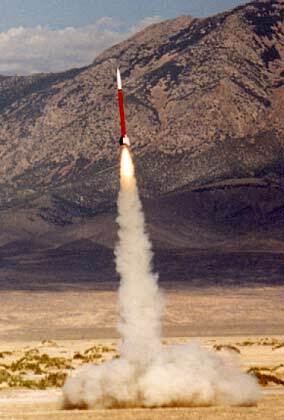 2) 5/08/99 J570-W Another excellent flight, but main chute deployed early again. Missile Works RRC2 reported 2616 feet. 3) 5/30/99 K560-W Excellent flight, and dual deployment worked as planned. Missile Works RRC2 reported 8649 feet. 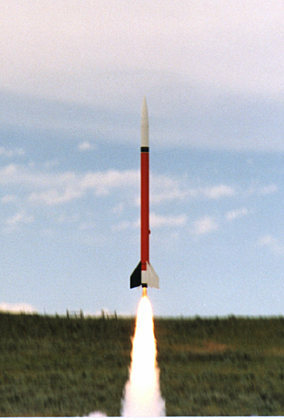 4) 5/30/99 L850-W Excellent flight, and the rocket obviously broke Mach! Dual deployment worked as planned. My first successful L motor flight. 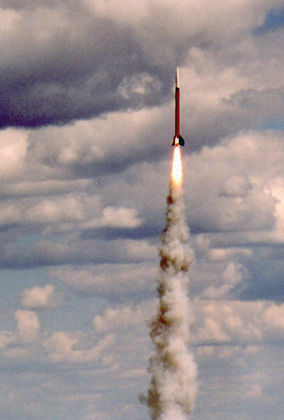 Missile Works RRC2 reported 10,547 feet. Tore the rear launch lug off. 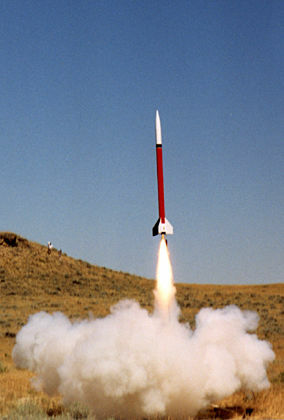 5) 6/19/99 J415-W Excellent flight, and dual deployment worked as planned. First launch off the blacksky rail. Missile Works RRC2 reported 3556 feet. 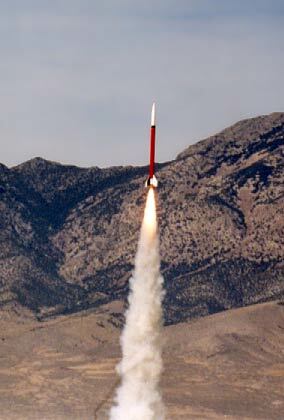 6) 6/19/99 J415-W Another excellent flight, and dual deployment worked as planned. Missile Works RRC2 reported 3912 feet. 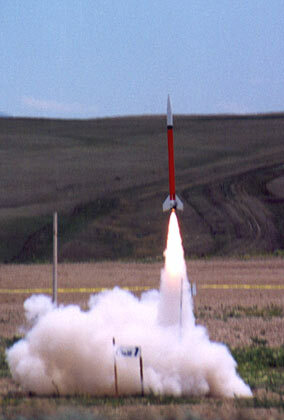 7) 7/10/99 J275-W Nice flight, and dual deployment worked as planned. Missile Works RRC2 reported 2050 feet. 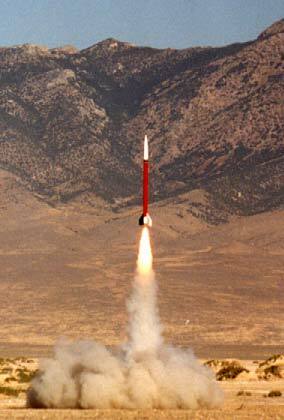 8) 8/14/99 J415-W Nice flight, and dual deployment worked as planned. Missile Works RRC2 reported 4046 feet. 9) 9/24/99 K550-W Nice flight. Missile Works RRC2 reported 5029 feet. 10) 9/25/99 K560-W Excellent flight. Missile Works RRC2 reported 8453 feet. 11) 9/26/99 K560-W Excellent flight. 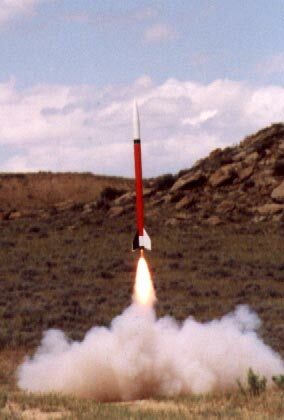 Missile Works RRC2 reported 8844 feet. 12) 10/9/99 K550-W Nice flight. Missile Works RRC2 reported 4907 feet. 13) 6/10/00 J275-W Nice flight. Missile Works RRC2 reported 2074 feet. 14) 7/15/00 J415-W Nice flight. Missile Works RRC2 reported 3430 feet. 15) 9/15/00 K560-W Great flight. Missile Works RRC2 reported 8703 feet. 16) 9/16/00 K560-W Nice flight. 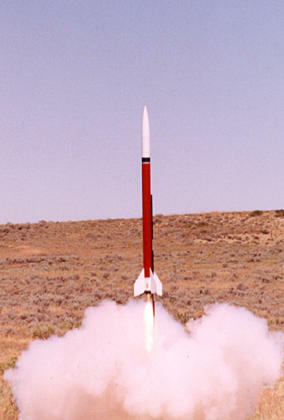 Missile Works RRC2 reported 8594 feet. Landed in shallow salt lake (what a mess). 17) 9/17/00 K560-W Another great flight. 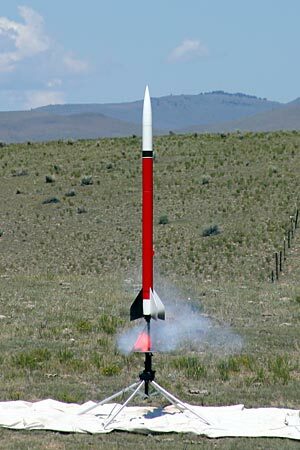 Missile Works RRC2 reported 8594 feet. 18) 10/14/00 J415-W Nice flight. Missile Works RRC2 reported 4110 feet. 19) 4/22/01 J415-W Nice flight. 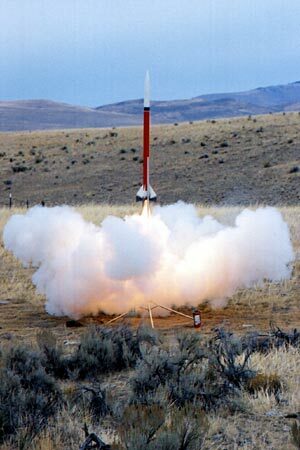 Missile Works RRC2 reported 4018 feet. 20) 5/19/01 J415-W Nice flight. Missile Works RRC2 reported 3926 feet. 21) 6/22/01 K560-W Nice flight. Missile Works RRC2 reported 8182 feet. Broke a fin off at the root during drag on ground. 22) 6/24/01 K560-W Fin repaired. Nice flight. 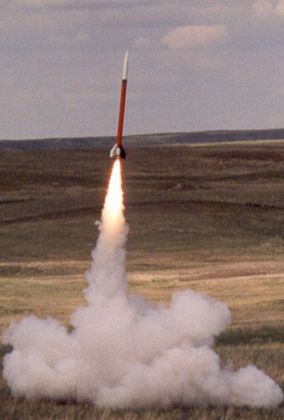 Missile Works RRC2 battery came loose during drag on ground, so no altitude obtained. 23) 10/11/03 L850-W Excellent flight, some fin flutter. 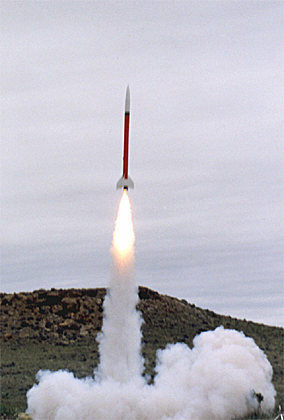 Missile Works RRC2 reported 10,971 feet. 24) 7/17/04 K695-R Nice flight. RRC2 reported 5602 feet. 25) 7/24/04 K1275-R Nice flight. RRC2 reported 8378 feet. 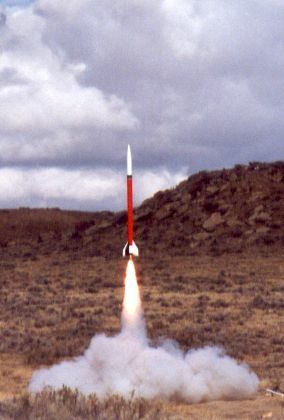 The Sandhawk on a J570-W. 5/08/99. The Sandhawk on a 75mm K560-W at Medicine Wheel 4. 5/30/99. The Sandhawk on a 75mm L850-W at Medicine Wheel 4. 5/30/99. 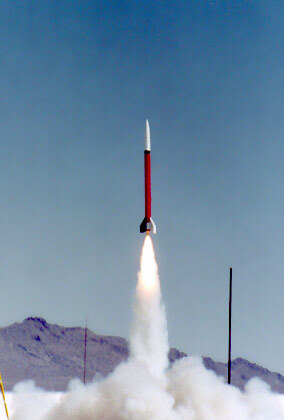 The Sandhawk on a J415-W. 6/19/99. The Sandhawk on a J275-W. 7/10/99. The Sandhawk on a J415-W. 8/14/99. The Sandhawk on a K550-W at HellFire 5. 9/24/99. The Sandhawk on a 75mm K560-W at HellFire 5. 9/25/99. The Sandhawk on another 75mm K560-W at HellFire 5. 9/26/99. The Sandhawk on a J275-W 6/10/00. The Sandhawk on a K560-W at HellFire 6. 9/16/00. The Sandhawk on a J415-W. 10/14/00. The Sandhawk on a K560-W at ROC Lake IV. 6/24/01. The Sandhawk on a L850-W. 10/11/03. The Sandhawk on a K695-R. 7/17/04. The Sandhawk on a K1275-R. 7/24/04.